Qatar Airways Cargo will start operating its twice-weekly freighter service to Mexico City (Mexico) on 11 June 2014. This new dedicated cargo route will mark the start of Qatar Airways Cargo operations in Latin America. “The first Qatar Airways Cargo flight to Mexico will be a historic moment for us, as it heralds the beginning of our operations in Latin America”, said Qatar Airways Chief Officer Cargo, Ulrich Ogiermann. “This is yet another important milestone for us, and it demonstrates that we are well on track towards becoming a world-class air cargo service provider with international reach. Our customers can rely on our extensive network of more than 40 exclusive freighter destinations worldwide, in addition to the freight delivered on our 134 passenger aircraft to 140 key business and leisure destinations globally”, he added in a Qatar Airways press release issued today. 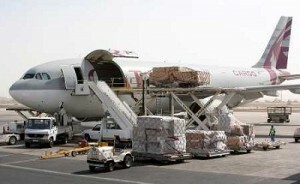 Qatar Airways Vice President Cargo for Americas, Ian Morgan said: “Mexico has one of the world’s largest economies, and it boasts one of the most developed manufacturing sectors in Latin America. The new dedicated Qatar Airways Cargo service will create new and exciting opportunities for businesses in Mexico and beyond.” Qatar Airways Cargo will operate the twice-weekly service between Doha and Mexico City’s Licenciado Benito Juarez International Airport, using the Boeing 777 freighter. Freighters will depart from Doha’s state-of-the-art Hamad International Airport on Wednesdays and Sundays, and from Mexico on Mondays and Thursdays. Major exports from Mexico include cars and vehicle parts, consumer electronics (televisions, mobile phones, LCD displays), oil and oil-derived products, silver, perishables and pharmaceuticals. Qatar Airways Cargo recently strengthened its product portfolio with the launch in January 2014 of two new premium services that optimise the transportation of time- and temperature-sensitive goods, including high-value pharmaceutical products and perishables. The new services, QR Pharma and QR Fresh, add to the company’s substantial range of cargo services and further enhance its capacity and flexibility to effectively move sensitive commodities in line with the highest world-class standards. On 1 December 2013, the first Qatar Airways Cargo shipment was received at the new cargo facility at Hamad International Airport. The enormous, state-of-the-art facility, spanning 55,000 square meters, contains a perishables storage area, amongst other key facilities, such as a live animal centre and dangerous goods area. The new self-contained terminal will handle 1.4 million tonnes of cargo per annum.